Heat 1 tablespoon oil in a 12-inch skillet over medium-high heat. Add the chicken and cook for 10 minutes or until well browned on both sides and cooked through. Remove the chicken from the skillet, cover and keep warm. Reduce the heat to medium. Heat the remaining oil in the skillet. Add the onion and cook for 3 minutes or until tender, stirring occasionally. Add the carrot, zucchini, garlic and thyme and cook for 5 minutes or until the carrots are tender-crisp, stirring occasionally. Stir in the soup, water and beans and heat to a boil. Reduce the heat to low. Cover and cook for 8 minutes or until the vegetables are tender, stirring occasionally. Stir in the lemon juice. Serve the chicken over the vegetable mixture. Sprinkle with the basil. 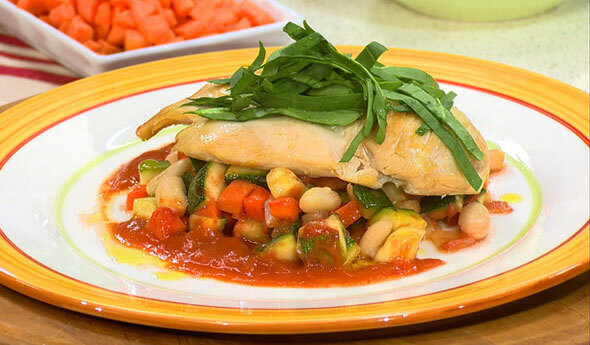 I can always count on Ellie Krieger for a delicious dish that is restaurant quality while still being healthy. My husband and I both loved it - we'll be making it again for sure. Kind of like a stew, with subtle flavors. I followed the recipe exactly and wouldn't change a thing.